Don't you wish there was still a young, firebrand company out there who were willing to give fans tremendously fun toys, the way McFarlane used to? Well, it turns out there is: NECA, the National Entertainment Collectibles Association. Their Reel Toys division seems dedicated to bringing us the toys McFarlane refuses to make, from Hellraiser to Gremlins. And while they "keep it Reel" with stuff aimed at older collectors, they're not afraid to throw some ultra-cute product at the market, as well. The Walt Disney Company started in 1923 in the rear of a small office occupied by Holly-Vermont Realty in Los Angeles. Within four months, the ever-growing staff moved next door to larger facilities; in 1925, the Disneys made a deposit on a Hyperion Avenue lot in the Silver Lake district of Los Angeles. During the next 14 years, many changes took place at the Disney studio: Mickey Mouse was "born" in 1928, followed by Minnie, Pluto, Goofy, Donald Duck, and the rest of the Disney gang. Yeah, the main five Disney characters sure have been kicking around for quite a long while, and while they've had a lot of merchandise in all those years, they've never had anything quite like this. 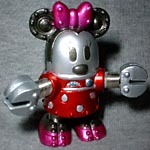 Combining classic beloved Disney characters with superdeformed robots, NECA has created the Disney Spring Robots. With springs for limbs, the 'bots come in two sizes: the industrial-sized 6" robots and the portable 2" scale. While only three characters are currently available at the larger size, you can bring home all five 2"-ers in one handy package. We'll start by looking at Mickey, the de facto leader of the gang. His head and body are one solid piece, with his distinctive ears simulated by a pair of satellite dishes. 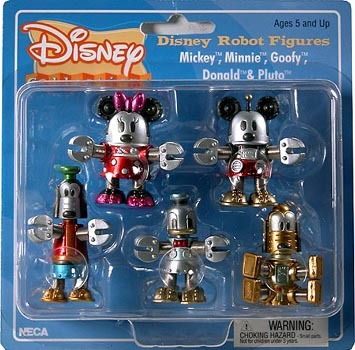 The fun of these Spring Robots is seeing how the designers recreate the characters' iconic looks, and Mickey is one of the best: his torso is black, since he never wears a shirt, while his shorts are still red. The giant buttons on his shorts are re-created by a set of exhaust ports - that's damn clever! His feet are bright yellow, just like Mickey's shoes, though it would have been cool if his merciless metal claws had been painted white. The only oddity is the antenna protruding from the top of his head. Minnie, of course, has the same basic one-piece design as her beloved. Of course, her torso looks like a red, polka dotted dress, and she has a bright magenta bow between her ears. Her feet are two-toned: the same magenta as her bow covers the bottom half, while the tops are black. This does a great job of suggesting the type of high heels Minnie always wore back in those old cartoons. She even has eyelashes carved into the metal above her eyes. She and Mickey are both 1 3/4" tall. Mickey's dog Pluto is a bit odd, in this set: he's sitting on his bottom, with all four legs sticking out in front of him. If you want to put his feet on the ground, you can, but he's then staring at the dirt. Plutobot's body is a nice yellow, with the appropriate green used for his collar and jetpacks. His tail is a sculpted part of his back, and his face looks remarkably like the cartoon version: there are two lines representing the wrinkles on his snout, his ears hang straight down, and even that weird little bump on the top of his head has been captured. Sitting down, Pluto is 1 5/8" tall. Donald Duck is the group's resident hothead. In robot form, the majority of his body is a metallic grey, with yellow feet and bill. His upper torso is painted blue, since he wore a shirt, and he's even got his little sailor hat. His bright red bowtie adds a nice spark of contrast, and the buttons on his shirt are exhaust ports, just like Mickey's. Donald's head is a separate piece, which gives him a point of articulation at the neck. Each of the 'bots has a distinct body shape, and the Duck's is slightly cone shaped, wider at the base than the top, since the animated Donald was similarly shaped. The sculptors even remembered to give him a little triangular tail beneath the key in his back. Our last figure is the character who has changed the most over his lengthy career, Goofy. Starting out as just a background character named Dippy Dawg, the Goof was then a sidekick for a while before becoming a star in his own right. He tried a variety of activities and professions, became a family man and eventually a loving father. The tallest member of the gang, Goofy is nearly 2 1/4". His face bears somewhat of a resemblance to Pluto's, since they're both dogs, but Goofy is wearing clothes: his usual green cap, orange shirt, red vest, blue pants and yellow shoes. He moves at the neck like Donald and Pluto do. There are all sorts of technological details sculpted onto these figures: dials, needles, knobs and panels cover their surfaces, and there are rivets along their edges. Each of them also has a pair of rocket boosters on their back, as well as a fifth spring that simulates the type of key used to wind little tin robots of the '50s. The "key" for each character is shaped like their initial: "D" for Donald, "M" for Minnie, etc. It's a cute little detail that gives the Disney Spring Robots character as well as showing how much attention NECA pays to their toys. When, exactly, did Todd McFarlane get old and boring? Tell us on our message board, the Loafing Lounge.